I have been working on the automatic recall of “doubles” as part of my mental maths programme. Mental maths?! It sounds a bit crazy, doesn’t it ? So what is mental maths and why teach it? Children ultimately need to be able to work out sums in their heads. This is a slow and gradual process which sees them moving from working out sums in a concrete sense, or with counters, to adding up in their heads. This process has 3 distinct stages 1) using counters to create and add up a sum 2) using a number line to add up a sum 3) adding up a sum in your head. You cannot bypass or hurry any of these stages. Children need to have grasped a stage completely before you even contemplate moving to the next. I cannot stress how important this is! A full and deep sense of what number is must be allowed to develop using counters. This can take longer for some children than others. Trust me, you move on at your peril. You will end up with a child who cannot see when things do not add up eg that 2 +5 could not possibly equals 1. Children with a good sense of number will see their mistakes and fix them. They can fix them because they understand. It is not some mechanical, robotic operation of moving mindlessly along a number line. Sorry, rant over! I have just seen so many children moved on too quickly and with terrible consequences. Once a child completely understands number and number lines then you can encourage “mental maths” by learning tables, playing games, explaining the laws of number and teaching visualization strategies. I hope that your child/class enjoys it too. All you need is 2 dice and some crayons. Please click here to download your game board. What do you think? 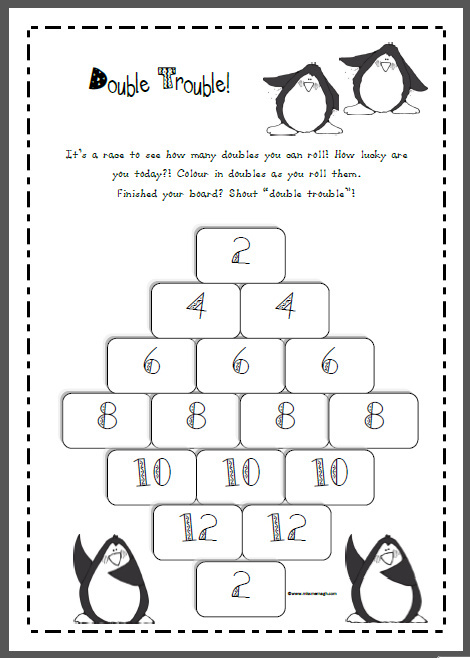 Would you like more maths games? Have you any questions on how to help your child with maths? I love to hear your comments and questions! 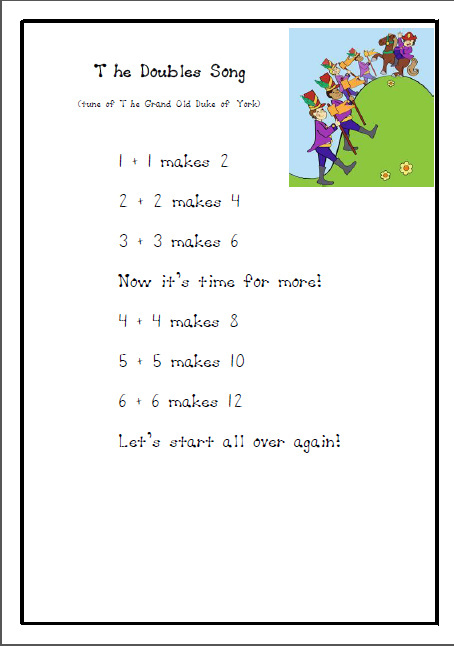 If you would like to learn how to help your child to move from Step 1 (counters) to Step 2 ( number line) click on this link to my Cute Number Line post. Seeing that you offer so many great ideas and resources free to teachers and parents worldwide; I thought I could contribute here too. I use the 100 square so much in Maths lessons….counting on, counting backwards, seeing if a number is closer to one tens grouping or another ie…is 44 closer to 40 or 50? Counting in tens. Mental addition: say 35 + 13 = ……. Well the child locates 35….10-20-30….the 35 is in the 30’s group. Well 13 =10+3….so to work out the answer…the child mentally works out that 35+10 = 45 +3 = 48. These are some very good Maths interactive maths websites online that use the 100 square. My near 6 year old son loves the 100 square too!